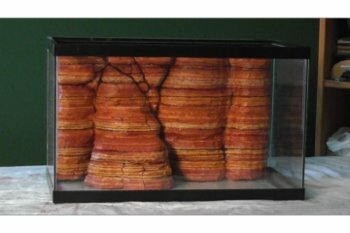 On this page I'll go over the process of making a sandstone rock wall for a lizard cage. Be sure to check out the video below on making this desert landscape design for a lizard cage, the video details every step of the process. The first thing I did was go online to a site like morguefile.com and find sandstone pictures, or desert pictures of various landscapes that might inspire ideas for this project. One thing you want to consider is whether or not your pet has expert climbing skills so he or she doesn't climb up and then not be able to get down without falling. I started out measuring the back of the cage, and made sure the final piece was going to be a little smaller than what I needed so that I would be able to fit the structure back into the tank once I was done. (eps)foam with ease and creativity, -the other benefit is you don't have the mess that you would have if you just used a knife. Once the foam was shaped and cut I glued it together with an adhesive called Loctite's Power Grab. This is a glue that bonds quickly and has a low odor. I let that dry and then proceeded to cover the enire piece with a product called "Foam Coat". This is done to give the project a strengthening agent in order to help protect it from damage. It doesn't mean that you can bump into a wall and <i>not</i> damage it, but the lizard will probably have a better chance of not damaging it with the strengthening agent. Be sure to watch the video on how to build this sandstone rock wall. It will hopefully give you some good desert landscape ideas for your project. Be sure to reference some good desert pictures for inspiration from a site like morguefile.com. After the stage of applying a mortar, I proceeded to paint the project with acrylic paints of various colors. I used a variety of colors ranging from reds to yellows and even whites and greys. I created a series of banding colors that gave the impression of layers of sandstone rock. This was rather time consuming, -if I had to do it over again I would do a series of much thicker bands of color that I would blend together to blur the lines of the paint. Other desert landscape ideas might be to incorporate certain types of cactus that are part of the landscape, or other things such as an old dead tree or other various bushes you might find in a desert landscape design. Once the painting was finished I proceeded to seal the structure with a non-toxic sealant called Shields All. A good non-toxic sealer will help protect your pet from any harmfull chemicals. It will also make your life much better as it's easier to clean and maintain. It will also extend the life of the project because it's less likely to be damaged in the future. Be sure to watch the video above on developing your desert landscape ideas in creating this sandstone rock wall.